I made on online order for a salad to be ready 20 minutes after the order was submitted. 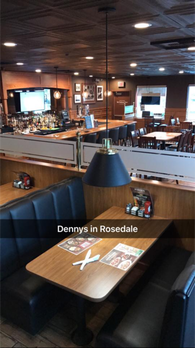 I arrived at Denny's 25-30 minutes later, giving them time to complete the order. Upon arrival, I waiting and additional 15 minutes because according to the server, the order was not submitted until they began their shift. And the server had no clue until I requested that I made an online order 30 min ago; and they began my order. I showed up 7 minutes after my time given to me on my recite & nobody seem to know where my order was. 8 minutes after finally located. Thank you for your review and feedback, I will discuss his issue with our team on keeping food warm. Thank you for your review, please come back and visit us again soon. My husband had to wait for a long time to get our togo order. They need to pay attention to the clients near the counter. The order was not properly made I asked for real eggs to be used on all three orders. This request was not met. I did not receive one of my slams I ordered and could not get through to anyone on the phone that day, also the food was barely warm. Thank you for your great review, hope to see and serve you again soon. They didn’t have one of the items I ordered and wouldn’t give me a refund so I had to wait half an hour for them to make it, making the rest of my food cold in the meantime. Very poor service. I got a free pecan pie for using the Denny’s app for a online order. It was yummy. It was ready when they said it'd be ready.